Assassin's Creed: Brotherhood is the third game in the historically based Action and Stealth game series. 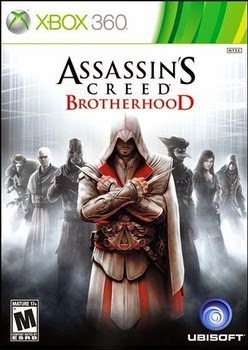 Released in 2010 on Xbox 360, Playstation 3, PC, and Mac OS X, Brotherhood picks right up where Assassin's Creed II left off, and adds some new features to the already improved gameplay of the second game. Assassin's Creed: Brotherhood begins where Assassin's Creed II ended. Ezio Auditore is in a secret chamber within the Vatican City witnessing an otherworldly being explain the dangers the Templars and their plans pose to human free will. 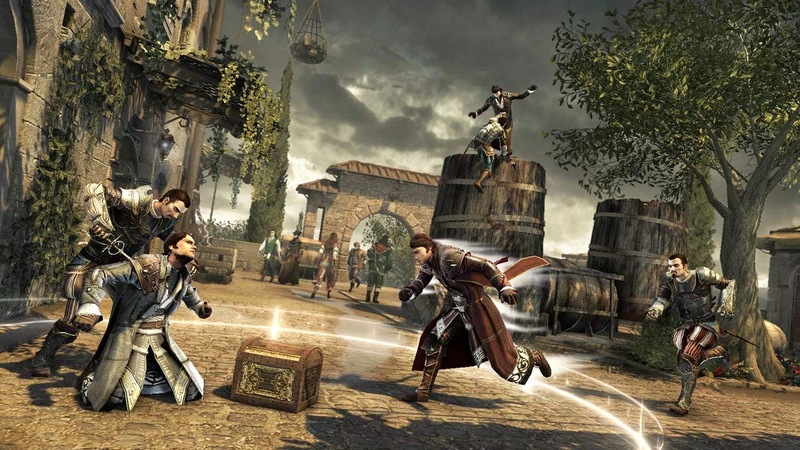 Ezio leaves the Vault, knowing that he must redouble his efforts to rebuild the Assassin ranks and resist the growing Templar influence in Italy. Upon returning home, Ezio is faced with tragedy as the Borgia (secretly Templars themselves) force Ezio and his family to flee to Rome and start over. On the modern-day side of things, Desmond and his new group of Assassin friends flee the Templar corporation Abstergo Industries and travel to the ancient home of Ezio Auditore in search of the piece of Eden, an ancient artifact with the power to control humanity that was hidden by Ezio. Desmond continues to enter the Animus (a piece of technology which allows humans to delve into their genetic memory) to re-live Ezio's experiences and to hopefully find where the piece of Eden is hidden. Now that I've lost my home, I'm forced to Rome. With his new knowledge that the Borgia are with the Templars, Ezio and his entire family plant new roots in Rome and begin working on building a new Assassin resistance. It works out quite well for Ezio that the man who forced him from his home, Cesare Borgia, is also the head of the Templars working in Rome. Ezio now has the chance for revenge, as well as saving the free will of humans from the megalomaniac Templars. Unfortunately, I found the story in Brotherhood to be quite underwhelming. None except for the final few story missions were very exciting, and at times the game felt like a chore. It really seemed like Ezio was just treading water, not really doing anything to meet his goals, until the final missions started to happen. Luckily (I guess?) there aren't many story missions. In fact, I couldn't shake the feeling that this should have just been a hefty expansion pack to Assassin's Creed II, and not a full-priced release. 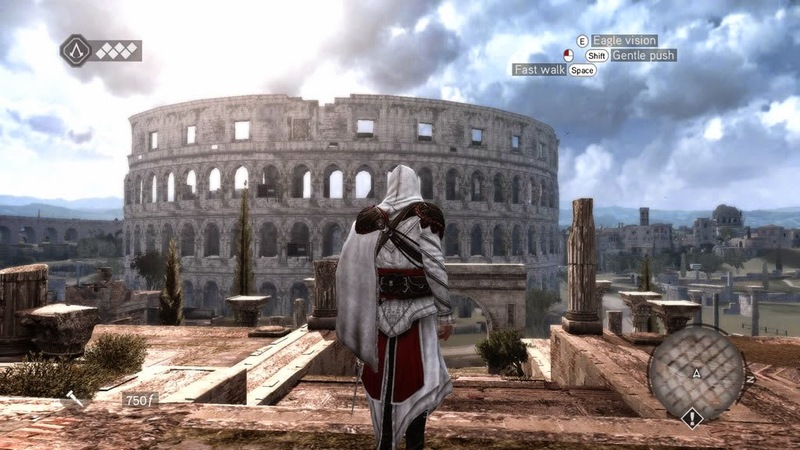 This time around, Rome is much more fleshed out than in was in the brief time spent there during Assassin's Creed II. 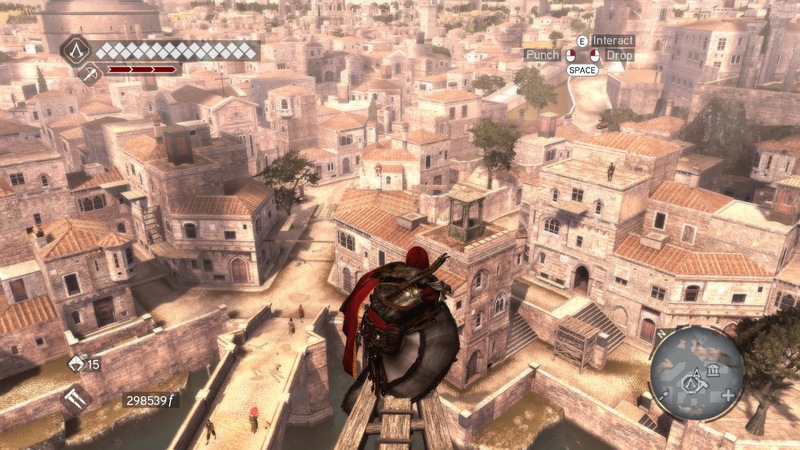 As usual, Assassin's Creed Brotherhood does an amazing job of rendering 16th century Rome. Many of the city's landscapes are breathtaking. Players will enjoy visiting familiar landmarks spread throughout the city, and exploring the numerous other locales around the city. Rendering Rome with such amazing accuracy and beauty comes at a cost, however, as a number of graphical issues rear their heads throughout the game. Screen-tearing is a major problem while running amongst Rome's buildings. I also had some problems with slow-down when a lot of action was happening on-screen. Finally, the camera can become a little wonky at times which can really hamper your sneaking abilities, especially when you can't see the enemy right in front of you. For the most part, gameplay in Assassin's Creed: Brotherhood is exactly the same as it was in Assassin's Creed II. 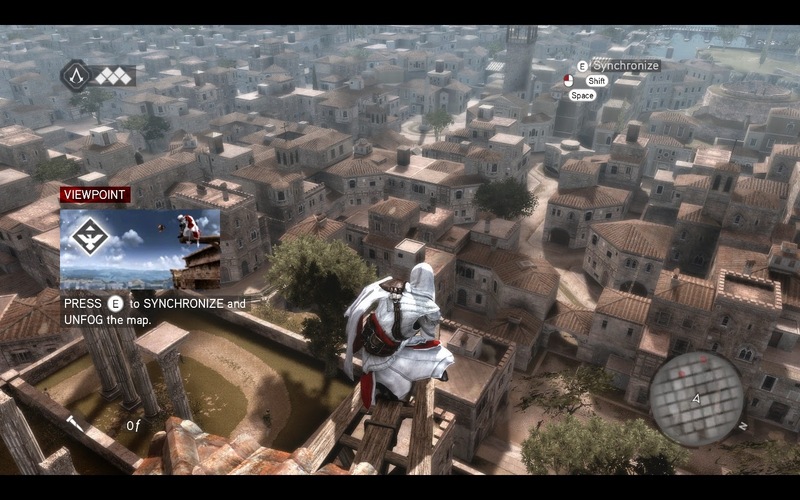 Ezio can still free-run throughout the city, vaulting fruit stalls and leaping across rooftops. Ezio still prefers silent, efficient, and deadly attacks to all-out open combat, which plays exactly the same as it did in the second game. 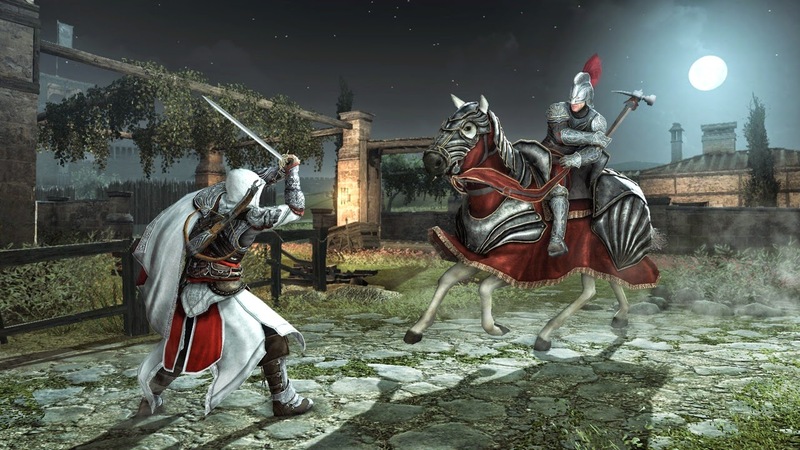 There are a variety of new weapons and armor for Ezio to use, though nothing that really changes the game. There are, however, a few missions in which Ezio is recruited by Leonardo DaVinci to destroy a number of advanced weapons that he was forced to design for the Borgia. These missions can be fun, as at the end of each you get to use the crazy DaVinci weapons before destroying them. 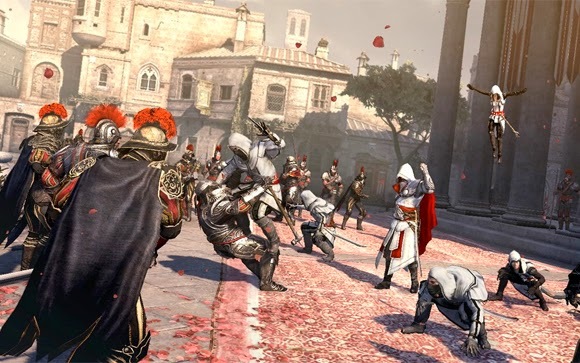 What is new in Brotherhood is that Ezio can recruit civilians throughout Rome to join in on the Assassin cause. Once recruited, Ezio can call upon these Assassins to assist him for a quick attack on guards or to lend a hand in open combat. Players can also manage their Assassin recruits using hubs around Rome. Recruits increase in effectiveness as they gain experience and level up. Calling recruits to aid in battle gives a small bit of experience, though players can send their recruits on missions throughout Europe to gain experience, money, and even rare items. Players must be careful, however, as these missions each have their own difficulties and, if not managed correctly, can lead to the permanent death of recruits. I found the ability to call in help on a tough mission quite helpful. It is also very cool to just call in death from the shadows to take out a guard that makes life difficult for you. I do wish that with as much work was put into managing recruits, that they were good for something other than calling in to help now and then. The only truly, completely new feature in Brotherhood, and how I feel that Ubisoft got away with making this a full release, is the multiplayer. Gamers can go online and play a cat and mouse game of hunting down targets while being hunted as a target yourself. All the free-running abilities of the Assassins' are at your disposal as you prowl the streets of Rome with just your wits to guide you to your target and keep you safe from other hunters. There are a variety of characters to choose from in multiplayer, as well as a mix of game modes which include a Free-For-All and Team Cooperation modes. In each of these modes, the stress and excitement of attempting to track your prey while avoiding other hunters can be thrilling. Are those guys taking a break from the fight and making wine up there?